(91outcomes.com) - The final agenda for the upcoming January 31 and February 1 meetings of the Congressionally charted VA Research Advisory Committee on Gulf War Veterans' Illnesses (RAC-GWVI) was provided to RAC members today, and shows the continuing focus on the development of the new VA GWI medical research strategic plan. 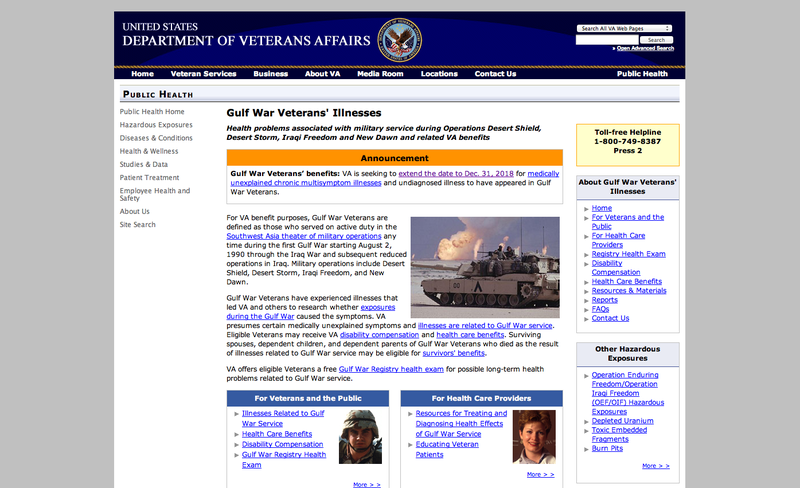 Since speaking up in frustration earlier this year about the lack of a true strategic plan to guide VA's medical research for Gulf War veterans' illnesses -- particularly Gulf War Illness (GWI) -- I've been pleased to see the response of VA, the RAC, and the newer Gulf War Steering Committee (GWSC). There has been a lot of important work done by the GWSC's nine working groups composed of RAC and GWSC members and leading GWI medical researchers. The new VA strategic plan on Gulf War veterans' illnesses is now nearing completion and, as of this writing, is is now squarely focused on developing and providing effective treatments to help improve the health and lives of the hundreds of thousands of Gulf War veterans still debilitated by chronic multi-symptom illness. During the RAC's next meetings that begin a month from today, our veteran-focused body will target much of its time on further developing the new treatment-focused strategic plan for VA. The first day's meetings will be joint meetings of the RAC, GWSC, and VA's National Research Advisory Committee, which helps oversee and guide all of VA's wide-ranging research efforts. Input from the non-RAC member public is always welcome and generally continues to be both well-received by the RAC and serves to guide the RAC in its mission. Public comments are welcome and encouraged on the issues being addressed during the two days of meetings and any other matter related to the RAC's purview. Public comments can be provided orally by those attending in person during the scheduled public comment periods, or in writing. Written public comments for distribution to RAC, GWSC, and VA-NRAC members should be sent via email to rac@bu.edu. The meetings will be held in Washington, DC at the VA headquarters building complex. Those wishing to attend via free teleconference should contact rac@bu.edu for instructions. Most of the major risk factors for developing cardiovascular disease, such as high cholesterol, obesity, and high blood pressure, are well-known, but one factor is often overlooked — too little sleep. "Sleep is a silent risk factor for cardiovascular disease," Dr. Chauncey Crandall, chief of the cardiac transplant program at the world-renowned Palm Beach Cardiovascular Clinic in Florida, tells Newsmax Health. "When your body doesn’t get proper sleep, your body is under constant stress," says Dr. Crandall, author of Newsmax's Heart Health Report newsletter. "All of us need between eight to ten hours a night. With less, your body is under constant stress, and that leads to the development of high blood pressure and heart disease." It's true that some people can function with less sleep, says Dr. Crandall, but on average, most people need between eight and ten hours every night — even older adults. In addition, they need to be in a regular sleep cycle of going to bed at the same time and waking at the same time each day. "The body likes predictability," he says. Sleep apnea affects the quality of sleep and puts stress on the heart. "With sleep apnea, the body goes through a cycle and stops breathing, especially at night, snorting and waking up suddenly," Dr. Crandall says. The heart slows, but when the person startles and wakens, the heart races. "The heart is never relaxed," he says. "It's slowing down, it's speeding up — the heart is never at rest." The cycles of slowing, then speeding, stress the heart. An effective way to deal with sleep apnea other than using a CPAP (continuous positive airway pressure) machine is to lose weight. "When you gain weight, you gain weight along your windpipe and that causes the back of the throat to close during the sleep cycle," says Dr. Crandall. "It can be reversed by losing weight." Instead of opting for sleeping pills to deal with insomnia, try changing your late-night sleeping habits, says Dr. Crandall. "Part of insomnia is the way we live our lives when we get ready for bed — we watch TV, we play video games, we're on the computer — we're getting the brain so excited we can't settle down. Stay away from computers and TV, read a quiet book, turn the lights down, and your sleep cycle will return to normal." Another deterrent to a good night's sleep is a full stomach. "Many of us go to bed with a full stomach, and it will keep us up," says Dr. Crandall. "Ideally, you should have your dinner at a regular time every night between 6:00 PM and 8:00 PM and not eat anything later. 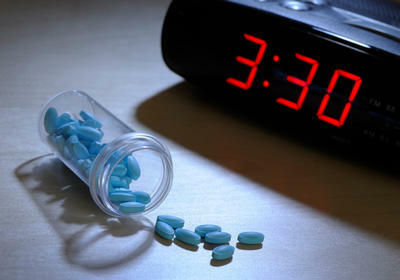 Go to bed on an empty stomach: When your stomach is empty, you'll sleep better."